Doctor Alexandra Inglis’ marriage is in trouble. Her husband recently admitting to cheating on her at the breakfast table. Alex (Al) is distraught but ultimately wants to make her marriage work for the sake of her two children. A one night stand with a stranger in Ibiza should be enough to hurt her husband, make them equal, and allow them both to move on. Jonathan Day isn’t actually a stranger. He is a patient that Alex does not remember treating. But that isn’t where the complications end, and for Alex the nightmare is only just about to begin. 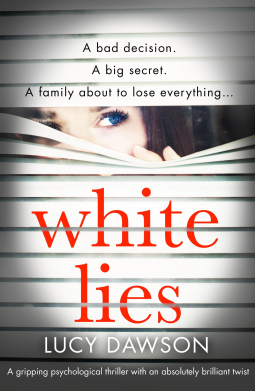 White Lies is one of those novels which is difficult to review without giving anything away. I love the way that this novel is written, from the points of view of several of the main characters, because you are never entirely sure who you should be trusting. I continued to be surprised right until the end. White Lies is a psychological thriller with a difference. Read it and I promise you will not be disappointed! White Lies is available now via Amazon online and all good book shops.